One of the longest-lived groups of early vertebrates, the conodonts, were identified with certainty as fishes only in 1983. Conodont elements, small (0.25-2 mm) toothlike structures made from apatite, have been known since 1856, and they are so abundant in many marine rocks from the Late Cambrian to the end of the Triassic that they are used for stratigraphic dating. Particular conodont species, and groups of species, are characteristic of certain stratigraphic zones, and they form the basis of a worldwide international standard of relative dating. Over the years, these small phosphatic fossils have been assigned to many groups: annelid or nemertean worms, chaetognaths (arrow worms), molluscs, representatives of a separate phylum, or even plants. associated with hearing and balance, and traces of what may be branchial bars. The phosphatic conodont elements lie beneath the head region, in the oral cavity on the pharynx. Conodont elements occasionally had been found in associations of several types, usually arranged in a particular way. These conodont apparatuses (Figure 3.6(a)) were interpreted as the jaw or filter-feeding structures of some unknown animal, and the 1983 find proved that they were indeed complex feeding baskets. 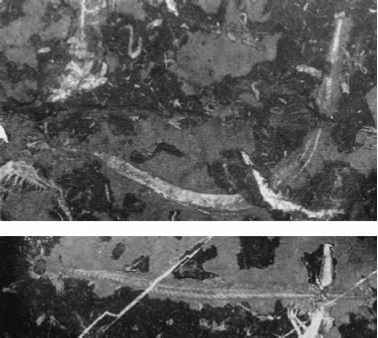 More recent work has revealed microwear patterns on different conodont elements, which demonstrates that they functioned in feeding, in seizing prey and chopping it into pieces (Purnell, 1995). The backwardly-directed teeth helped the conodont stuff its food into its mouth, and perhaps prevent any live prey from escaping. 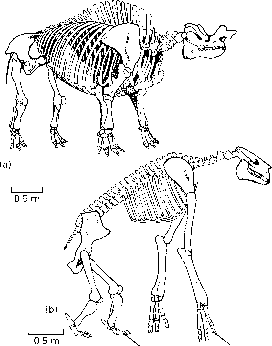 traces on either side in some specimens (Figure 3.5(a)). 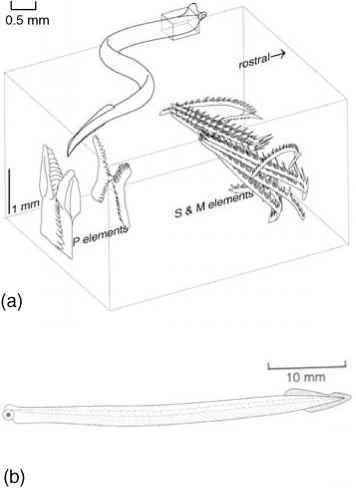 Overall, the conodont animal looked very like a small lamprey (Figure 3.6(b)). The affinities of conodonts have long been debated, and the new whole-body specimens did not at first resolve the issue. The consensus now is that conodonts are vertebrates, and more derived than the extant lampreys and hagfishes (see Box 3.1). Chordate synapomorphies are the notochord, the dorsal nerve cord, the myomeres, the tail and the midline tail fin. Vertebrate synapomor-phies are the cranium in front of the notochord, the paired sense organs, the extrinsic eye musculature (absent in hagfishes) and the caudal fin with radial supports. The dentine and enamel of conodonts, as well as the eyes, with their sclerotic eye capsule, presumably developed from neural crest tissues of the early embryo, a clear vertebrate feature (see section 1.4.4; Donoghue et al., 2000). Conodonts are more derived than living lampreys and hagfishes, as they share the presence of bone-like calcified tissue with other vertebrates, and there are at least two types: dentine and enamel-like tissue.